Bees are essential for ecosystem health; pollinating trees, plants, flowers, vegetables and fruits. One third of the UK’s food is pollinated by bees. On the 2nd August 2017 Phlorum attended a ‘Meet the Bees’ event in Manchester at Towers Business Park, where our Northern Region operations are based. 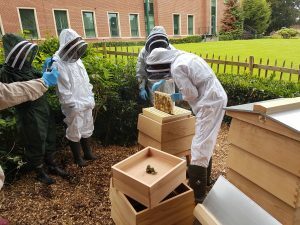 A bee hive has been installed at the business park and staff were shown live bees using the hive. We were told that there are three main types of bees that occupy a hive. The Queen is the central component, producing new offspring. The worker bees (females) collect nectar and pollen, clean the hive and remove dead bees to surrounding countryside. In the summer a hive is supported by hundreds of male drones who continually search for new Queens. The males do not work and are evicted, to their death, in early autumn by the females. There are large areas of Himalayan balsam on neighbouring land at Fletcher Moss, Didsbury and by the River Mersey. Himalayan balsam can be recognised by their bright purple flowers and sweet, balsam, odour. Along with Japanese knotweed, Himalayan balsam is listed on schedule 9 of the Wildlife and Countryside Act as a non-native invasive species (INNS). Honey bees can travel up to 3 miles to collect pollen and are particularly attracted to Himalayan balsam at this time of year. Phlorum carry out invertebrate (i.e. insects, including bees), Himalayan balsam and Japanese knotweed surveys in Manchester and the North-West. If you would like advice on Japanese knotweed or would like us to quote for an Invasive Species Survey, please do get in touch.